Defense Holdings, Inc.® (DHi®) is a world-class team of dedicated engineering, manufacturing and program management professionals committed to developing and deploying innovative technologies to advance the national interest and improve the lives of all Americans. Known as The Idea Company®, DHi was founded in 1994 to provide professional engineering and program management services to the federal government. We developed metal fiber brush and photoluminescent materials product lines for federal customers through the Small Business Innovative Research (SBIR) program. DHi was a 2000 Tibbetts Award Winner. The Tibbetts Awards were established to recognize small firms, individuals, projects, and organizations best exemplifying the technological achievements of the Government’s ongoing SBIR program. DHi largely divested its government services segment in 2005 to concentrate on commercialization and expansion of research and products business segments for both government and commercial markets. In 2006, DHi was honored to win the Anne Arundel County (Maryland) Tech Council’s Tech Innovator Award. 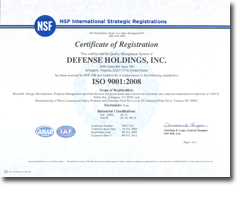 Defense Holdings, Inc.’s present focus is research, product development, manufacturing, installation and aftermarket customer support. Our two principal products lines are metal fiber brushes and slip ring products for power and data transmission and photoluminescent products. DHi has been ISO 9001 registered since 2003, and always conducts business with quality in mind. Our goal at DHi is not customer satisfaction. It’s customer delight. DHi is a privately held, Service-Disabled, Veteran-Owned, Small Business (SDVOSB) and was named SBA (Richmond) Minority Small Business of the Year in 2001.
read one of our many e-Brochures!